Sea to Summit Comfort Plus Insulated Mat. Comfort Plus Insulated sleeping mats with their dual layer construction provide the most effective system for fine-tuning the level of comfort available in any air mattress today. The two independent high-resolution cell layers give excellent support by distributing your body weight and shape over more cells. The dot-welds in the two layers are also offset for more uniform insulation and cushioning. Due to the fact that the two layers can be pressurized independently, the top layer can be inflated to your personal comfort, while maintaining a high-pressure base layer for protection from the rough or uneven terrain. Both layers can be adjusted independently using the fine tune valve to get just the right level of softness and support. Sea to Summit uses Exkin Platinum®, a quiet non-woven fabric, to reflect radiant heat back to the user and Thermolite®insulation to prevent convective heat loss between your body and the ground. All Sea to Summit air sleeping mats come with an Airstream Pumpsack, a repair kit containing six self adhesive patches for repairing punctures in the field, and a spare silicone one-way valve insert. Exkin Platinum® fabric and Thermolite® insulation are combined to prevent radiant and convective heat loss. Sea to Summit pioneered the use of a liquid TPU lamination process in outdoor products. Common in the medical and aeronautical industries, it is vastly superior to the roll-to-roll film lamination process usually used in air pads. The TPU bonds better and more consistently than a film, virtually eliminating delamination issues. 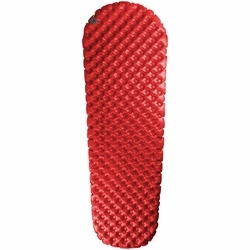 The Comfort Plus Mat has an R-Value of 5 and is ideal for all season use.